On Tuesday, The Athletic’s Ethan Strauss published a deep dive into Kevin Durant’s impending free agency, headlined “Silent star: On the presumed Warriors’ exit of Kevin Durant”. We’ve noticed you haven’t talked in awhile. It is it anything to do with something on your mind? Why do you care? I didn’t feel like talking the last couple days. Nah, I just didn’t feel like it. Anything to do with the conversation about free agency? That’s the conversation you’re going to have. I don’t think about that kind of stuff. That’s your job. You’ve been around the noise for so long. Is it bothering you more this year? Is it louder this year? It’s unnecessary. You got a dude, Ethan Strauss, who come in here and give his whole opinion on stuff and make it seem like it’s coming from me. He walk around here, don’t talk to nobody, just walk in here, survey and write something like that. Now y’all piling on me because I don’t want to talk to y’all about that. I have nothing to do with the Knicks. I don’t know who traded (Kristaps) Porzingis. That got nothing to do with me. I’m trying to play basketball. Y’all come in here every day, ask me about free agency, ask my teammates, my coaches, rile up the fans about it. Let us play basketball. That’s all I’m saying. Now when I don’t want to talk to y’all, it’s a problem with me. C’mon man. Grow up. Grow up. Yeah, you, grow up. C’mon, bro. I come in here and go to work every day. I don’t cause no problems. I play the right way. Well, I try to play the right way. I try to be the best player I can be every possession. What’s the problem? What am I doing to y’all? So? Who are you? Why do I got to talk to you? Tell me. Is that going to help me do my job better? Nah. I didn’t feel like talking. So? What’s the problem now? You’re not usually quiet. You usually share your opinions. So people are trying to figure out what’s going on. What’s wrong with Kevin? He’s playing OK, but he’s not talking right now. I just don’t trust none of y’all. Every time I say something, it gets twisted up and thrown out in so many different publications to try to tear me down with my words that I say. So when I don’t say nothing, it’s a problem. I just want to play ball. I want to go to the gym and go home. That’s all. Is that a problem? — From Warriors PR: Any game questions? How do you feel like you’re playing, how is the team playing the last couple weeks? I’m done. You know you don’t care about that. The league is currently replete with superstar angst, guys with one foot in decent situations and another foot in the possibilities of some distant city. Even when guaranteed more money with the home team, grass in other pastures looks greener than the promised cash. Sources say teammates would understand if KD left what looks like perfection. It’s just a harder sell to the public writ large. What’s the PR-friendly reason for leaving a favorite that appears primed to reign for ages? KD’s catch-22, or catch-35 if you will: He’ll likely be criticized for ring avoidance by the same people who ripped him for ring chasing. None of this would be a problem if Durant tuned out criticism, but few are better known for bathing their own wounds in salt. 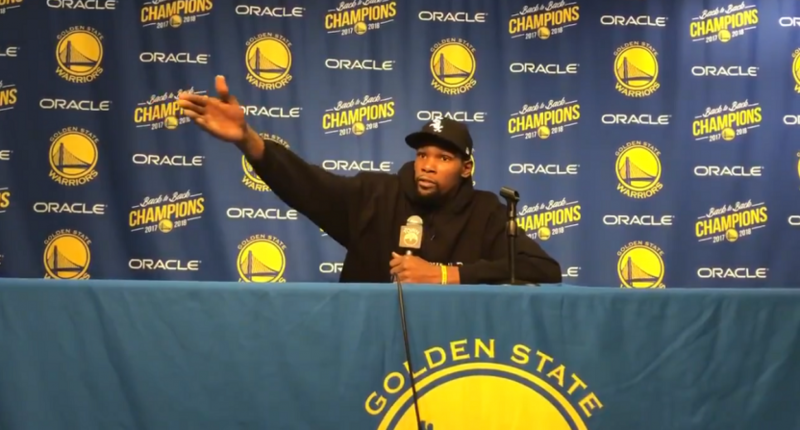 Durant’s diatribe might be fundamentally misplaced; part of his job is to talk to the media, whether he wants to or not. But for Durant, specifically, his silence is kind of understandable. The offseason speculation has been rampant for a long time now, ironically in part because his team’s dominance has made the outcome of this season much less interesting to talk about. This is probably not a discussion that’s going to end any time soon, either.